Three-wheeled vehicles occupy a strange legal space somewhere between cars and motorcycles. Some of them are basically cars with one less wheel, while others are motorcycles with an extra wheel. Most are in a fuzzy grey area in between the two. Of the many questions revolving around the issues of three-wheeled vehicles, one of the more interesting ones is whether the occupants of such vehicles should be required to wear helmets. From a legal perspective, any vehicle with less than four wheels has traditionally been considered a motorcycle. Three-wheelers have been registered as motorcycles, required a motorcycle operator's license, and have been subject to any helmet laws that apply to two-wheeled motorcycles. During the 1970s most states enacted universal helmet laws to qualify for federal highway funding. But in 1976, states successfully lobbied Congress to prohibit the U.S. Department of Transportation for penalizing states for not having helmet laws by withholding such funding. Most states have rolled back their helmet laws since then. According to the Insurance Institute for Highway Safety, as of April 2018, only 19 states have laws that require helmets for all motorcycle occupants. Another 28 states have a partial helmet law, requiring their use only for occupants ages below 18 or 21 depending on the state. 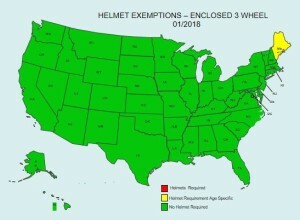 Three states—Illinois, Iowa, and New Hampshire—have no helmet laws at all. Elio Motors has been the subject of a great deal of criticism. Its affordable three-wheeled car, known simply as "the Elio," was scheduled to begin production in 2012, but still has not begun today, six years later. The company is desperately trying to raise money to remain open long enough to actually start building cars. But Elio has made one successful accomplishment: the creation of the "autocycle" vehicle category in many states. This category recognizes vehicles that have three wheels but are fully enclosed and operated like a car. While they are still registered as motorcycles, neither a motorcycle license nor a helmet is required to operate them in most states thanks to Elio's efforts. 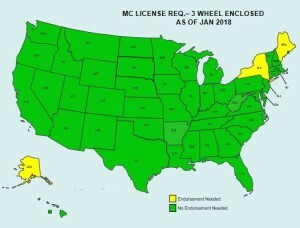 As of January 2018, Elio reports that only three states—Alaska, Maine, and New York—still require a motorcycle license to operate an autocycle. Additionally, only Maine's partial helmet law, requiring helmets for occupants below the age of 18, applies to the Elio. No helmets are required in the other 49 states, regardless of regular motorcycle helmet laws. This actually makes a great deal of sense. The Elio's occupants are fully enclosed, plus they have seat belts and three airbags to protect them in a crash. There are older cars on the road with less crash protection than the Elio. Even the BMW C1 motorcycle was exempt from helmet laws in some parts of Europe because of the roll cage surrounding and protecting the rider. What if the Elio was a convertible? Then you'd have something like the Morgan Three-Wheeler, Polaris Slingshot, and Vanderhall Venice. Each of these is quite different to drive from each other, but they are all three-wheeled vehicles with no roofs and the controls of a car. Should helmets be required in these? Polaris says yes. On its website, it states, "Helmet laws vary from state to state and are dependent on Slingshot classification. Slingshot recommends always wearing a DOT approved full face helmet." Open top three-wheelers often have windshields, but they may not be particularly effective. Yet a Mazda Miata's windshield doesn't offer perfect protection, either. One time a friend of mine was driving her Miata in its proper top-down configuration, and narrowly avoided wearing a roadkill squirrel that was kicked up by the truck ahead of her as a non-PETA approved scarf. Additionally, these vehicles ride so low to the ground that road debris kicked up by other traffic becomes a hazard. Sand, pebbles, or litter that might occasionally hit your covered leg on a motorcycle could whack you in the head in one of these cars, or your eye if you're not wearing protection. Not Alex Roy's Morgan Three-Wheeler. Alex Roy may have called us all cowards for driving our cushy enclosed four-wheelers. But that didn't stop him and Zach Bowman from wearing full face helmets during their record-breaking Los Angeles to New York trip in a Morgan Three-Wheeler. For hours and hours of fast highway driving it was quite a reasonable precaution for a risky endeavor such as theirs. But Roy doesn't wear a helmet while cruising slowly around New York City. When I test drove a Vanderhall Venice I was required to wear a helmet for the demo, but I left my modular helmet fully open the entire time. My sales rep also wore an open face helmet. At no point did I feel like we were in any danger from flying debris. But we were also just casually driving around town, not speeding down the interstate or carving corners in the canyons. If I was taking more risks, I might have wanted to flip the front of my helmet down to provide full-face coverage and protection. Three-wheeled motorcycles of the traditional tricycle configuration, with two wheels in back and one wheel in front, require a very different riding style from a two-wheeler, despite identical controls. The trike doesn't lean like a two-wheeled bike, so the rider has to steer the handlebars rather than countersteer and lean the bike to turn. This style of trike, common to large bikes such as Harley-Davidsons and Honda Goldwings, can be tricky to ride if you don't know how (that goes for motorcycles with sidecars, too). If you attempt to slow down and turn at the same time it can be fairly easy to lift one of the rear wheels off the ground. Most trikes aren't designed to lean, and this can lead to a lack of control followed by a crash. There are reasons why off-road three-wheeler all-terrain vehicles were banned in 1988. Although unlike motorcycles these trikes will support themselves, I think their unique handling characteristics make helmets just as necessary as on their two-wheel variants. A Harley-Davidson Road King with the Tilting Motor Works three-wheel kit. Last year I had the opportunity to try a different kind of Harley trike—one that was designed to lean like a two-wheeler. The Tilting Motor Works kit replaces the front wheel with a race-car-like double wishbone suspension and provides a level of control I've never felt in a Harley-Davidson before. Uniquely, it still leans just like a two-wheel motorcycle to turn, but the front end feels extra planted to the ground. The Yamaha Niken has a vaguely similar configuration. Any motorcyclist can just hop on one of these and ride it with no extra skills or training required. I will never ride a two-wheeled motorcycle without a helmet. And as stable as the Tilting Motor Works kit makes a Harley, I wouldn't ride it without a helmet either. All the same reasons to wear a helmet on a two-wheeler apply to the Tilting Motor Works kit as well. And then there's the Can-Am Spyder, which is different in its own unique ways. While it, too, has an independent front suspension, it's designed to not lean in the corners. It's easiest to think of it as a street-legal snowmobile with wheels. I took a quick spin up and down the road on one once, and my motorcycle riding skills worked against me when it came to turning. If I had experience riding snowmobiles I'm sure it would've been a different story as that set of skills kicked in. Unless you're racing or driving at a track day, you don't need a helmet in a car. Regardless of what the law says, I think you do need a helmet on a motorcycle. But what about the three-wheeled vehicles I've described here? It seems silly to wear a helmet in an Elio, but I wouldn't ride a three-wheeled Harley without one, regardless of where the third wheel is. I was comfortable in the Vanderhall Venice with my modular helmet open, but I'd probably want to shut it for higher speeds. Personally, I believe in leaving the choice of whether to wear a helmet or not up to the individual without laws telling us what to do. But if I had to choose where to draw the line between the helmet and non-helmet three-wheeled vehicles, I'd probably draw it where the vehicle loses its top and becomes an open-air roadster. And I'd draw it there more for the occupants' protection from flying objects kicked up from the road than for crash or rollover protection. The Polaris Slingshot Grand Touring LE, equipped with the Slingshade roof. But even then, there's a grey area. The Polaris Slingshot was designed as an open-air roadster, but there is now a "Slingshade" available that gives it a roof. By my standards, should a Slingshot with a Slingshade require a helmet or not? I honestly have no idea. In fact, right now I'm glad I'm not the one who has to come up with these laws. It's hard. If you're wondering why this goofy thing has three wheels, this video offers a great explanation. Also, deliveries were delayed again, and the price of the car went up.